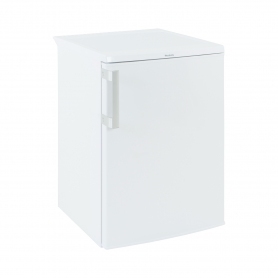 With a 113 litre capacity – enough for 5 bags of shopping – the Lec R5517W fridge is perfect for couples and small families. Measuring just under 85 cm tall it easily slots underneath most kitchen worktops, giving you more room for your shopping without costing you any floorspace. Looking for the same model with a more compact design? 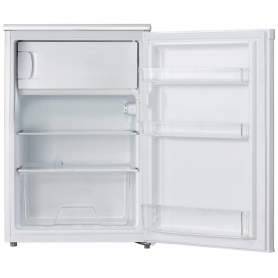 This model is also available with a 97 litre design – R5017W. A pair of glass shelves and a salad crisper can be found at the base of the R5517W, providing well organised storage for your fresh produce that you can check at a glance. This section is perfect for keeping your fruits and vegetables crunchy and full of flavour. The transparent shelves help you to find what you’re looking for quickly – no more digging around the back of your fridge. Not only this, but the glass is easy to wipe down, so you can quickly clean up any spills or mess. This model’s shelves are adjustable, so you can raise of lower them to suit your needs. 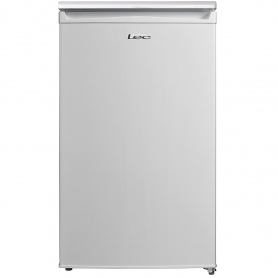 Get the perfect fit for all your shopping with Lec’s great R5517W. As fridges and freezers are left to run, choosing a model with good energy efficiency could save you a lot of money on your utility bills. Holding an A+ rating for energy efficiency, you can rest assured knowing that the R5517W won’t cost the earth to run. Keep food fresh and well-organised with the handy undercounter R5517W from Lec. Order yours today.